Returning from the summer break, the 2018 Formula DRIFT Black Magic Pro Championship headed to Seattle, WA for Round Five: Autozone Throwdown presented by Rain-X. With the first half of the season over, and one of the most competitive driver line ups ever seen in the sport, it is time for teams to make a push to the Finals at Irwindale Speedway in October. And with only 39 points separating the top three places, there is still everything to play for. 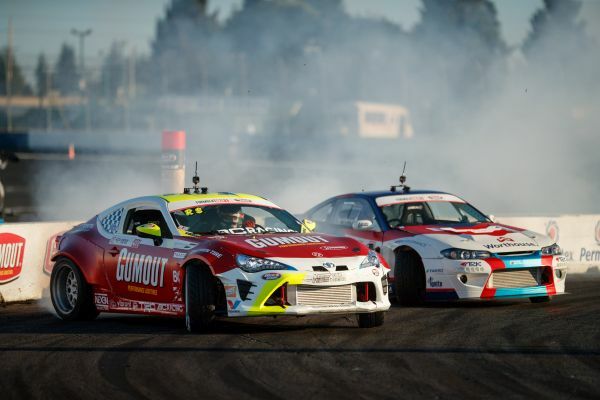 As the event got underway, Formula DRIFT was delighted to announce it had signed a new three-year deal with the operators of Evergreen Speedway in Monroe, WA. This has secured the future of FD Seattle at the venue it has used successfully since 2005. Warm sunshine greeted the teams for Friday qualifying, but dark clouds could be seen over two areas in the pits. One of these was because Forrest Wang (USA) had to watch helplessly while his team raced to swap the engine on his Vapetasia / Achilles Radial / NRG Innovations Nissan S15. Miraculously, they completed the task in time but the engine failed to start, meaning Wang, who finished second at the opening round in Long Beach, CA would fail to qualify. Qualifying fourth was Piotr’s teammate, James Deane in his identical Worthouse / Falken Tire Nissan Silvia S15. He placed in front of fifth place Fredric Aasbo (Norway) in the Rockstar Energy Drink / Nexen Tire Toyota Corolla, who matched the Irishman’s first run points tally but withdrew from the second run with head gasket problems. Having led the FD Pro standings for the first three rounds, Aasbo’s recent inconsistency is understandably concerning for him but you can never count out the Norwegian nor Papadakis Racing. Saturday would see the first repeat winner crowned in the 2018 Formula DRIFT Black Magic Pro Championship. Such has been the ferocity of the competition that different drivers have stood on the top step in every previous round until now. However, the early interest in Seattle was focused on two local drivers who had the Washington crowd on the edge of their seats. Star of the show was Matt Coffman from Central Point, OR driving the Coffman Racing / Thunderbolt Racing Fuel / Achilles Radial Nissan 240SX S13. He was intent on improving his previous best finishing position for 2018, which saw him reach the Top 16 at the opening round in Long Beach. Coffman’s first match-up was against 2009, 2014 and 2016 FD Champion Chris Forsberg (USA) in the NOS Energy Drink Nissan 370Z on Nexen Tires. Forsberg had plenty of momentum following a win in Orlando and a podium in Atlanta. The smart money was on the NOS Energy Drink driver but Forsberg encountered problems with a loss of power during the run. This caused Coffman to collide with the stricken Nissan 370Z on the banking during the first run. Both drivers took a five-minute technical timeout to make repairs, but a repeat of the problem in the second run handed Coffman the win.
. The impact was hard enough to break Pawlak’s tie-rod arm and cause Gittin Jr to collide with the wall after crossing the finish line. Unable to repair the Mustang RTR in time, Gittin Jr handed the win to Pawlak who was able to reach the startline for the second run. With intense battles going on throughout the heats, another local boy in the points hunt at FD Seattle was Cameron Moore from Battle Ground, WA driving the Cameron Moore Drift / Falken Tire Toyota GT86. He vanquished Jhonnattan Castro (Dominican Republic) in the GPP / Toyota Racing Falken 86 in the Top 32 heat after an epic battle. With nothing to choose between the two drivers, the judges would call for “One More Time” not once but twice. This meant they ran a total of six times and the crowd was ecstatic when the decision went to Moore. Sadly, he would succumb to Kristaps Blušs in the Top 16, but the spectators were whipped into a frenzy as Moore and Coffman performed at the highest level. For the Great 8, Deane would encounter Matt Field (USA) in the Wish / Borla / Falken Tire Chevrolet Corvette. Field was lucky to reach this stage after a collision with 2015 FD Champion Fredric Aasbo in the Top 16. Driving the Rockstar Energy Drink / Nexen Tire Toyota Corolla, Aasbo had slowed into one of the clipping zones, causing Field to make contact. This put Aasbo down on points, which he was unable to overcome on the second run. “This win was no easy task,” said a typically understated James Deane after the podium celebrations. “There were some incredibly close battles this weekend. Everybody was fighting extremely hard but we had some luck with our toughest opponents making small mistakes. Ryan Tuerck was delighted with his second place after an extended absence from the podium. “It feels like a long time since I was last here so we’re all very excited. This really boosts morale and confidence after the team worked so hard during the break to resolve all the small problems we had with the car. We also caught up with Formula DRIFT president, Jim Liaw to get his views on the event: “We love the fans in the Pacific Northwest. They’re awesome and it’s what brought us here in 2005 and why we’ve stayed ever since. This is such a great venue and every year has been a capacity crowd.